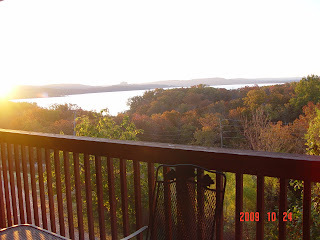 We recently returned home from another vacation in Branson, Missouri...We love that place! 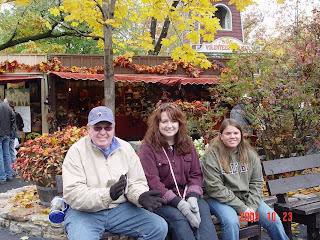 This time our oldest daughter Lisa and her husband Brad and their daughter Bailey joined us. 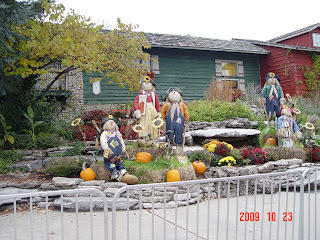 We saw a Chinese acrobats show that was really good, and we spent a couple of days at Silver Dollar City amusement park where they were having their annual Fall Craft Festival. We enjoyed watching the artisans perform their arts and we also enjoyed shopping at the booths. As usual they had several music shows throughout the park, and all of their awesome rides for the thrill seekers. 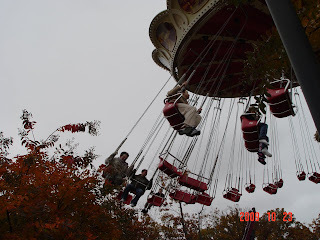 This grandma doesn't go on those, but I did go on the swings and the tea cups which are more my speed! Ha! John and I were there for 4 days before our kids arrived, so we stayed in a little cabin/cottage that had a kitchenette so that I could cook a little bit. 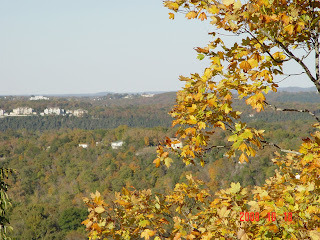 It had a great view, but it wasn't very nice, so when the kids came we moved over to the condos and it was much better. 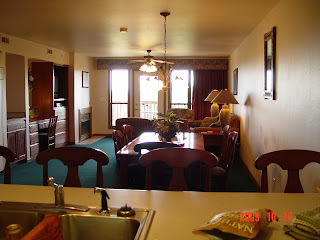 It was spacious and had a full kitchen so we had a couple of good homecooked meals and we enjoyed the fireplace when the nights turned chilly. 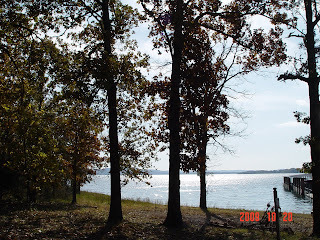 We went on a couple of scenic drives and also took lots of pictures. One night we had a delicious meal at Ruby Tuesdays, but our refrigerator was full so we did a lot of breakfasts, lunches, and dinners in the condo. John and I were there for 9 days and we enjoyed every minute. 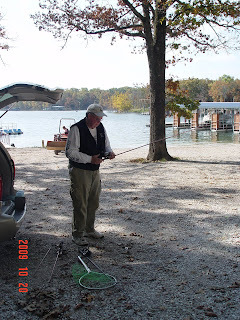 He rented a little boat and went fishing for a few hours one day, and golfed the next day. I read a couple of books while I was there. I love to read and I enjoyed it as I sat outside and enjoyed the view as I read. I also took a nature walk and it was heavenly! I listened to the birds, and watched the squirrels running around picking up the acorns, and I watched the leaves floating softly to the ground as they fell from the trees in the breeze. We also had deer on the grounds. It is such a beautiful place to visit. 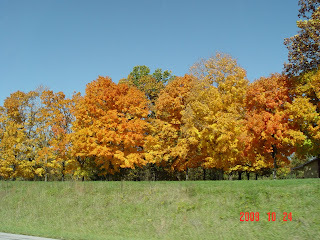 This year the trees weren't as vivid as they have been in past years, but they were pretty just the same. I love the hills and the valleys, and the lakes, and the trees. I will try to limit my pictures to the ones I like the best, but it will be hard. ((smile)) I hope I don't bore you with all of these. I am just crazy about the beauty of God's creation! That fall color does look quite a lot like that we have had. 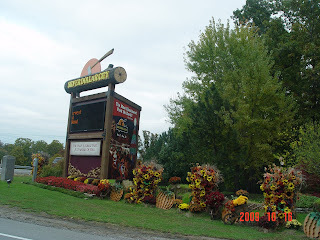 We didn't have such a lovely fall last year as we had an early snow. My husband's parents own property in Branson on the Payne Stewart Golf Course. My FIL is all excited about building in a couple of years. He has a very fine, fancy house planned & we all think he is crazy! Beautiful! So glad you enjoyed yourselves and time with family! The pictures are all beautiful! 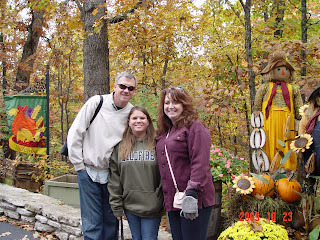 I love the fall colors and I love the ones of your beautiful, smiling face :) I'm glad you had a great time. It sounds like a great place to go! Great pictures and so glad you had a good time. I have never been there but I have always heard it's alot of fun. Thanx for sharing. I have never been to Branson but it seems like a really neat place!! I'm glad you got to spend time there and with family too! Linda the photos are beautiful! 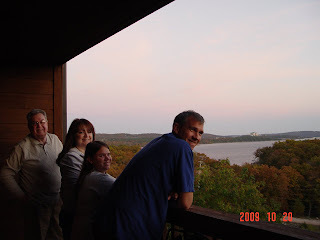 It has been years since we were in Branson so I am sure that it has changed a lot since then. I'm glad you got to go and spend time with family and enjoy it. Thank you for your sweet comment on my blog. It truly was an honor for me to be with my granny when she passed to her Savior! I'm so thankful that I will see her again one day! I have been waiting for the pictures from your trip! I love fall pictures. Hey,if you ever don't have a kid to bring on a trip with you, I will volunteer, all 10 of us! it looks like you had a fabulous vacation. 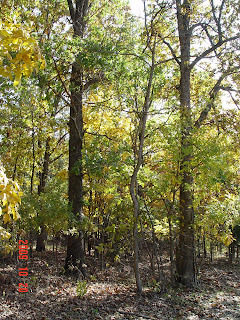 The fall foliage trees are incredibly beautiful! I'm so glad you guys had such a great time. 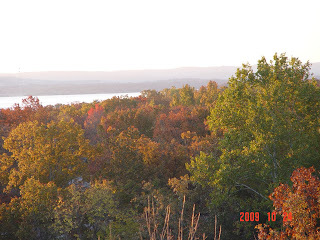 Branson in the Autumn looks glorious!